When students came back to school this year, reports surfaced that their summers were spent in a markedly different way than summers of year’s past. With the explosion of the video game Fortnite, a high-intensity, sniper game that has reached international acclaim, parents, it seems fought harder than ever to “get the kids off the couch” and outside to play. Horror stories shared among parents included an 8-year-old who was so fixated on Fortnite that he soiled his pants instead of pausing for a bathroom break. Reports of children playing for 8 and 9 hours a day were commonplace, and tantrums and fierce resistance shocked parents when children were forced to stop. At the start of the new school year, teachers rapidly became aware of the Fortnight epidemic as well. Whether overheard among the passionate chatter among students, e.g, “Dude! I killed him so bad. It was epic,” or, simply colleague’s stories of their students being “extra-hyper” and dazed during class time it appears that this highly popular game is causing problems at home and now in the elementary and middle schools. 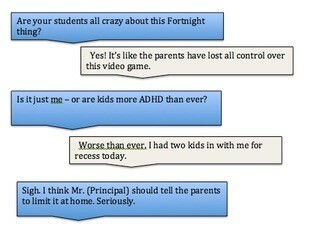 Teachers and Parents are equally troubled about the Fortnite ‘problem.’ If we explored a typical modern-day, texting exchange among teachers might it look something like this? Given the reasonable concerns, why then, do I personally allow my own children to play this game? Why does any educated parent permit Fortnite? Reason #1 digital internet-based Leisure is simply not going away. I believe it is today’s playground. Just as we use a washer and dryer for doing our laundry, and pay bills by internet, we are increasingly choosing our fun and diversion via screens and electricity. And yes, this makes many of us a little sad. The culture of how we experience leisure---children and adults alike---is embedded in a screen-heavy, format. Yes, many people still enjoy playing an intense game of soccer outside or even a fishing trip. Many people still draw and color or do word searches. But where TV perhaps paved the way for entertainment to storm into our homes, video games have a similar, but more intense hold. Consider that today’s airline travel is considered inhumane if passengers are deprived of some form of screen-based entertainment, especially for longer flights. (Can you remember the last time a flight attendant passed out magazines?) In other words, the tide has changed, and it is here to stay. Reason #2 When shared with other players, the important benefits common to play, in general, are enjoyed. Known benefits include conversation skills, strategic thinking and use of imagination. In other words, aside from its addictive quality (I will address that in a moment) Fortnite provides the long-acknowledged benefits of play. There are problems, however. (But directly causing children to commit mass murder is not one of them, by the way). Fortnite is addictive. Playing the game delivers rapid, automatic rewards (defined as a quick ‘buzz-type’ feeling within seconds of the player engaging). In Scientific terms, this is called an automatic reinforcer. These are the toughest reward types to extinguish and are highly addictive. Think of being at the movies and continuously feeding yourself buttery popcorn. As soon as the kernels hit your mouth—you are receiving a reward (pleasure in your taste buds). Where as this reward is right away – in contrast—consider how long it takes to be rewarded by another activity. If you were to take a stroll along a beautiful beach, it is enjoyable and rewarding. However, it is not an automatic reinforcer because you aren’t being bombarded with intense pleasure/reward chemicals every time your foot strikes the sand. When game play is interrupted without warning or transition, children often lack the maturity to regulate their response to the sudden cessation of the intense pleasure. (Again, imagine that while you are funneling popcorn into your mouth, the whole bucket is unexpectedly snatched from your lap). The difference is, the mature adult—generally---can adjust their disappointment and regulate their behavior to avoid throwing a fit. Children, in contrast, struggle with this. Game play is limited to an hour a day. A visual timer is set so that players have a sense of time and can anticipate when they will have to stop. If upon stopping there is a tantrum or disrespectful behavior, the next day’s play will be forfeited. Since an active lifestyle is important, game play must be only one part of how the children experience leisure and play. Outside play, sports, reading, building things, must continue to be enjoyed. As with any activity or reward, it must be seen as a privilege. As such, it can be revoked if chores, homework or other expectations are not met. (Of course, any other rules for gaming behavior, safety and online etiquette also apply to Fortnite). Ultimately, like any trend or popular activity that children encounter in popular culture, Fortnite must only be permitted at the discretion and approval of the adults in charge. Given its popularity, I do not foresee it disappearing. Rather, I see it evolving or changing to meet the growing and changing online appetites of the current generation. Mandy Stern is a board-certified, licensed Educational Psychologist, with national certification in school psychology.